In Malaysia, McDonald’s has ditched its iconic red background and replaced it with green to celebrate the major Muslim holidays of Ramadan and Idul Fitri (Hari Raya), while retaining the yellow arch. 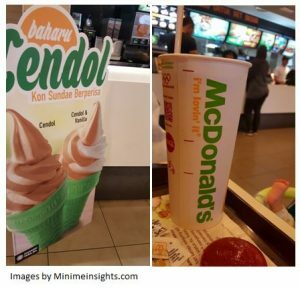 The name of McDonald’s on the cup has been changed to green, while the cone of the limited-edition Cendol Soft Serve Ice Cream is in green. As green is the colour often associated with Raya, the words and some of the bowls and plates for the new festive menu are shown in green. This shows how far McDonald’s can go in localising its menu and branding to improve acceptance.